Stephen Frears and Judi Dench deflate the British Empire. Victoria & Abdul isn't just another boring "private lives of royals" historical drama. There's a certain segment of the movie audience that absolutely adores the "private lives of royals" historical dramas — stuff like The King's Speech or Elizabeth, with their sumptuous settings and extravagant wardrobes. Bald as it might be on meaning beyond the purely decorative, that particular class of costumed drama — especially the ones concerned with the British monarchy — holds a built-in appeal for some filmgoers. For the rest of us, up-close-and-personal glimpses into the private chambers of kings and queens bear an uncomfortable resemblance to daily newspaper advertorials showcasing the latest $25 million mansion for sale; they're fantasies for have-nots who enjoy pretending, for just a moment, that they're rich, famous, witty, and eating their Cheerios with a silver spoon. Leave it to Stephen Frears (High Fidelity, The Queen) and screenwriter Lee Hall to take hold of this chickenhearted subgenre and give it a generous shot of real-world political sass. 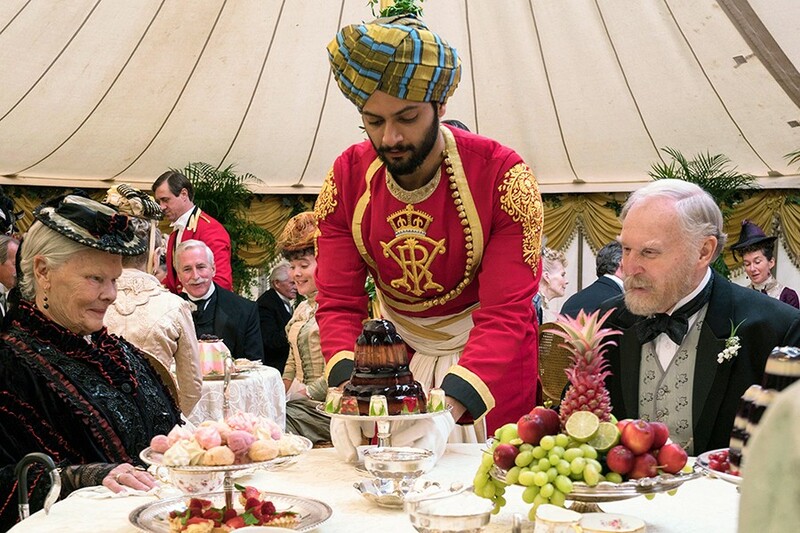 While his new release, Victoria & Abdul (based on the book by Shrabani Basu), contains its share of conspicuous consumption, his tale of a lowly Indian civil servant who befriends the most powerful woman in the world, Queen Victoria, manages to burrow down beneath the pomp and circumstance to deal with recognizable human beings. Specifically, human beings who consider other human beings automatically inferior, as part of an organized cultural system — and the remedy for that. In 1887, when Victoria is 68 years old, a mild-mannered man named Abdul Karim (Bollywood star Ali Fazal) is plucked from his clerk's post at a prison in Agra and put on a ship to London, along with another nobody called Mohammed (Adeel Akhtar). Their mission: to dress up in preposterous pseudo-Indian outfits, bow and scrape before the lady, present the Empress of India with a commemorative coin as part of Her Majesty's Golden Jubilee, and then disappear. Abdul does not follow orders. The queen takes a liking to him, invites him to be her Munshi (secretary), and goes on an Indian-inspired binge of language study and palace redecoration, with Abdul as her constant companion. Members of Victoria's court are aghast at the upstart newcomer and immediately begin plotting against him. How dare this wog chum around with the Queen of England? Dench, who has impersonated Victoria before, in 1997's Mrs. Brown, portrays her here as an intelligent, inquisitive, but massively sheltered widow, bored with her isolation and endless duties and quite happy to chitchat about the world, over tea with one of her 400 million subjects. There is so much to learn. She is surprised to find out that Abdul is Muslim rather than Hindu, for instance, and is curious about the Urdu language and this mysterious fruit, the mango. Fazal's Abdul, on the other hand, gives the impression of an unsophisticated man thrust into a lucky situation, content to string it out as far it will go, but nevertheless charmed by his new friend's candor. Frears and his writers evidently embroider a bit on the pair's real-life relationship, but never shy away from depicting the prejudiced jealousy displayed by "Bertie" (Victoria's son, the future King Edward VII, played by Eddie Izzard), Sir Henry Ponsonby (Tim Pigott-Smith), Dr. Reid (Paul Higgins), Baroness Churchill (Olivia Williams), and the other courtiers. To them, brown-skinned Abdul, with his burqa'ed wife and his indifference toward the royal toadies, is the worst sort of foreign imposter, a wretched peasant trespassing far above his station. Their class snobbery and outright racism is eventually countered when Abdul's sidekick, Mohammed, fed up with chilly, damp, xenophobic England, puts a curse on the British Empire with the movie's most scalding piece of dialogue. The implications of Victoria & Abdul are inescapable. The filmmakers have seen the future and know full well that Victoria's heirs will lose their empire, just as the queen loses her number one Subcontinental admirer. Directed by Stephen Frears. With Judi Dench and Ali Fazal. Opens Friday.